Search has been the foundation of internet since its inception. It is impossible to remember everything we need to and same applies in Teamie. 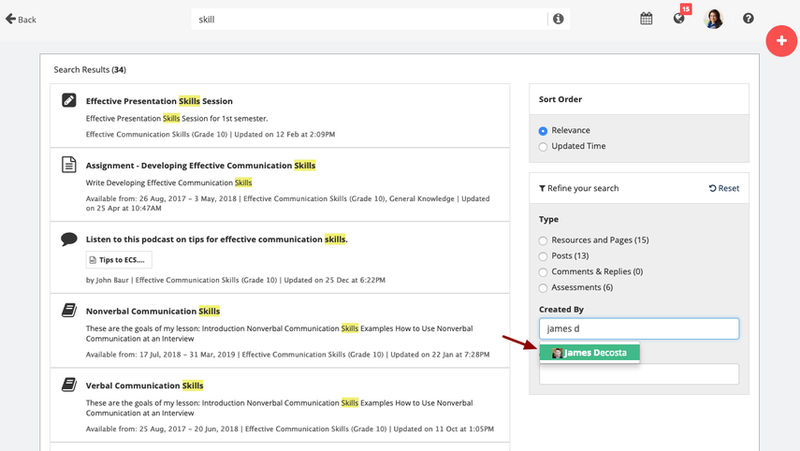 You can find a universal search bar in the top navigation bar in Teamie. This will make accessing content, you are looking for, easier and faster. Teamie's universal search bar helps you find content by typing any keywords and searching through posts, comments, replies, lessons and lesson pages and assessments. 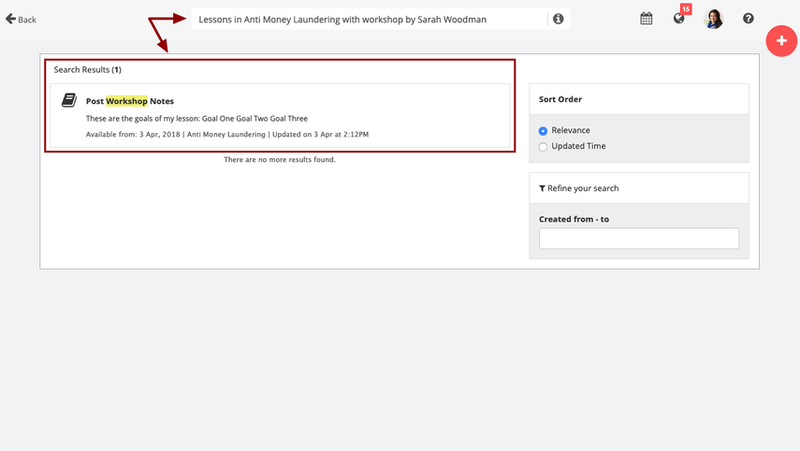 Once you get your search results, you will be able to refine your search through a set of filters. 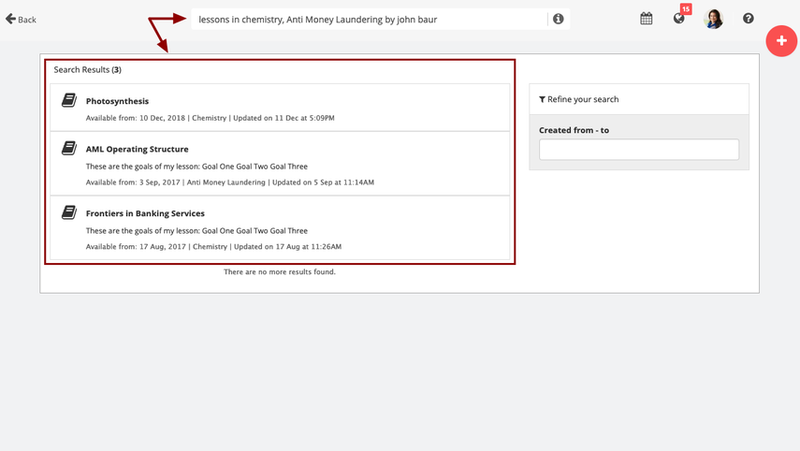 You can also use the smart search to search content with the help of some smart search operators. 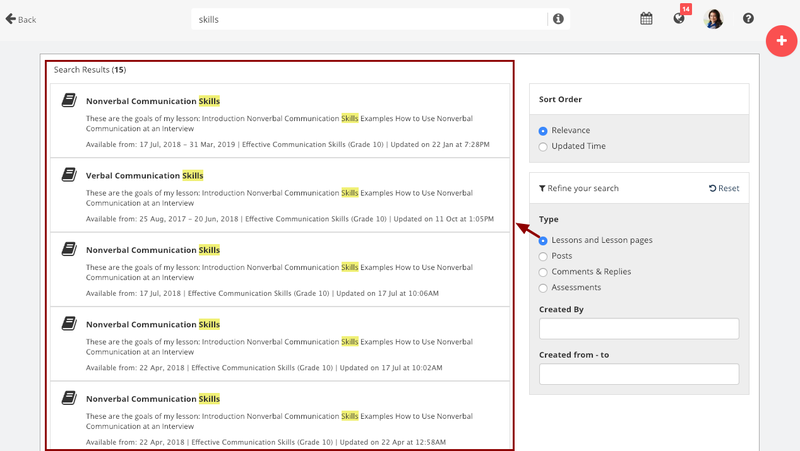 Overall, using the search option, you can search content/classrooms/users on Teamie. And fear not about content security. People can only search through content they have access to. So if I'm a learner and I type "design", I'd see results only from my classrooms. 1. 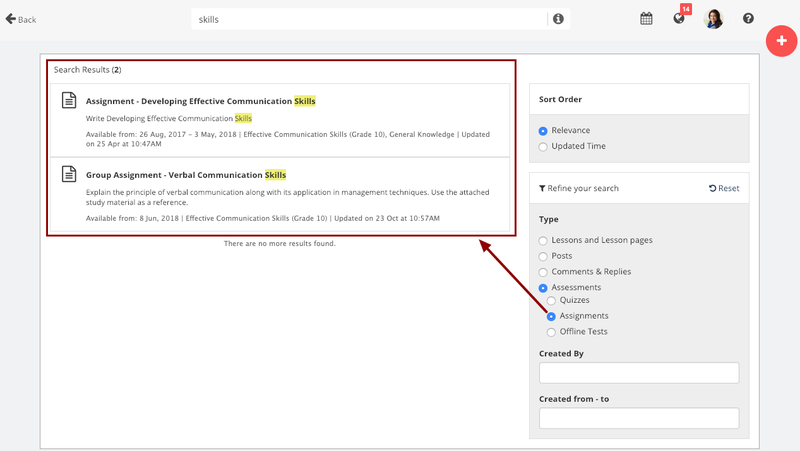 You can perform search and find the relevant content you are looking for, by using the Search box provided at the top navigation bar. 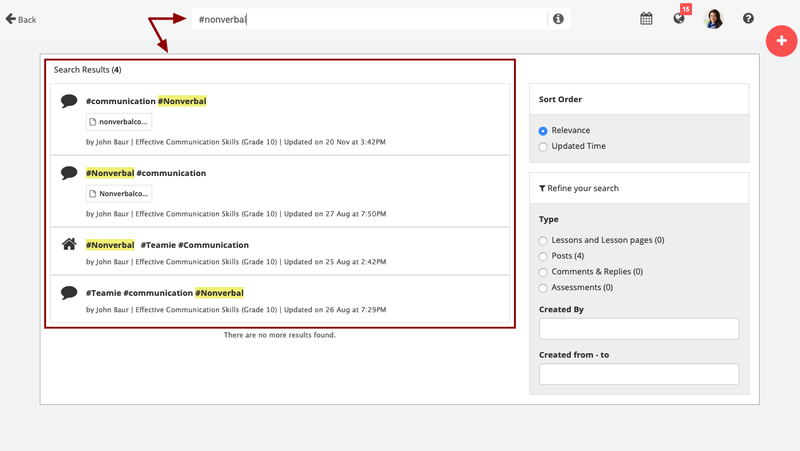 Click the search box to enter the term/keyword for which you wish to get the search results. 1. 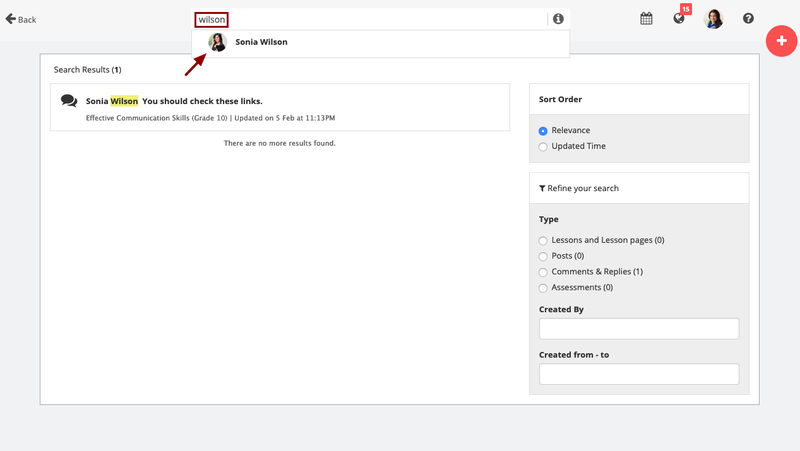 You can now quickly access your classrooms (also known as modules, programs, groups etc) from anywhere on the site by typing in the first few characters of the classroom in the search box. 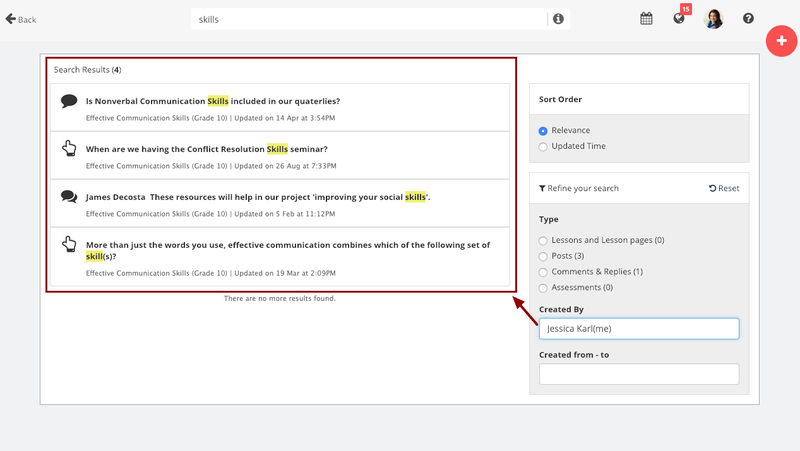 The matching classroom suggestions will start populating in the dropdown. 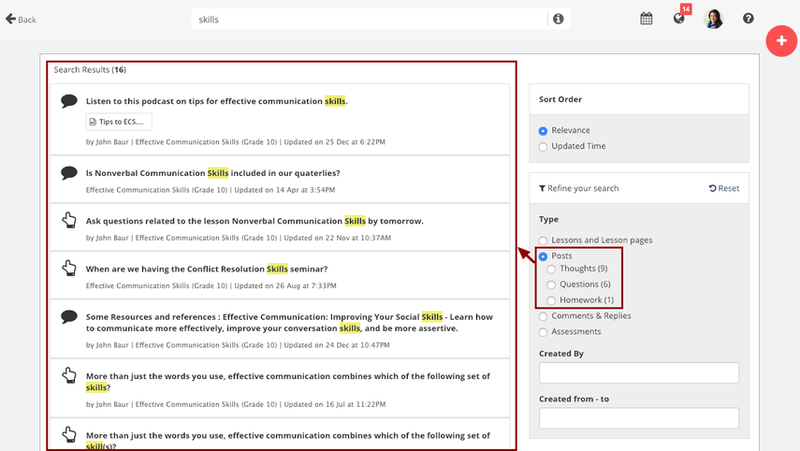 In case, there are matching results for content/users for the searched term/keyword, in addition to classroom(s), then the classrooms will be listed at the top. 2. 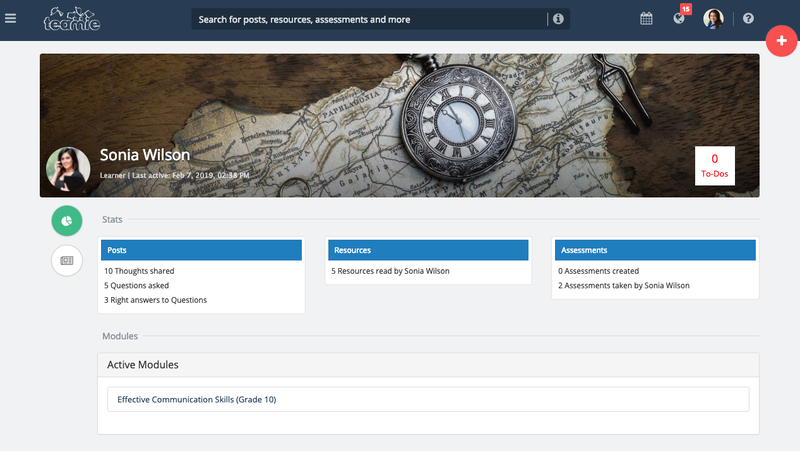 Click the required classroom to access its newsfeed page. 1. You can also go to any of your connections' profiles. Start typing the first few characters of their name in the search box and you will start seeing the matching results in the drop-down. You can search from their first name as well as their last name. As an administrator, you can search for all the users on the site (active as well as blocked). 2. Clicking on a user's name will take you to the user's profile page. 1. Access Teamie search and enter the search term / keyword and find the relevant content you are looking for. 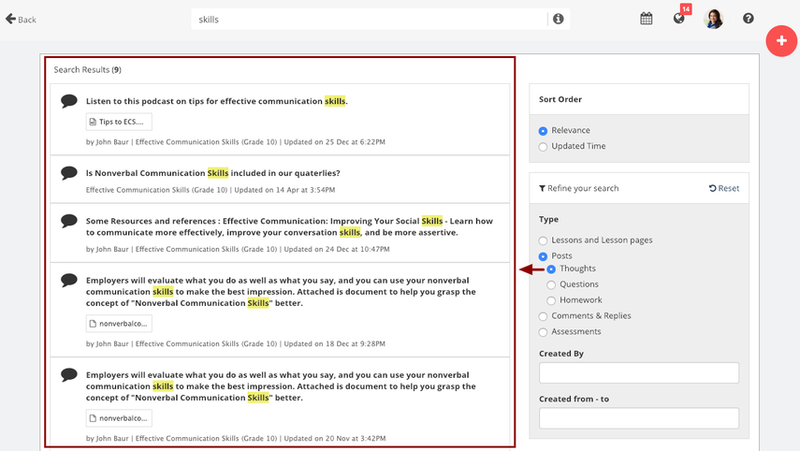 Once you start typing in the search box, you will start seeing suggestions for the matching content/classrooms/users. 2. Teamie also remembers your search history and shown them as suggestions when you perform search next time. 3. If required, you can clear your search history by clicking Clear search history link. 1. 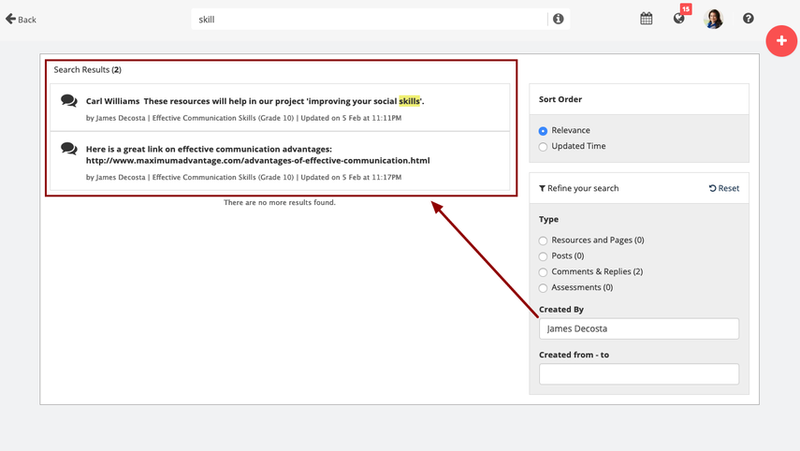 You can search content on the basis of the type of content. 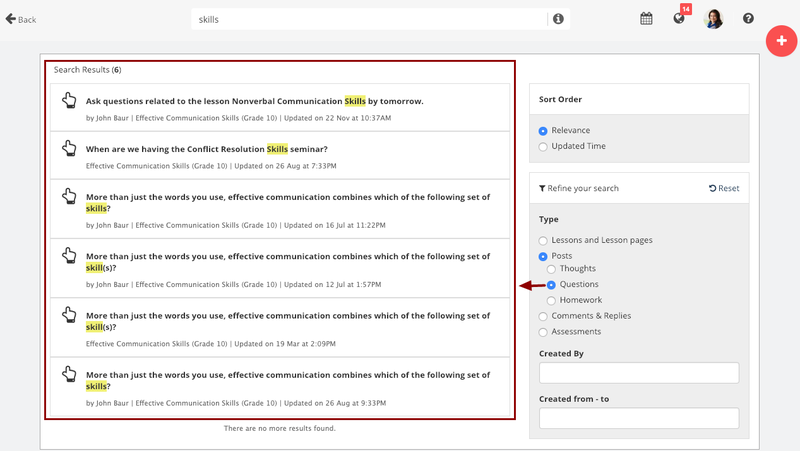 Matching searches will include results from lessons, lesson pages and assessments as well as from posts' content and comments and replies. The number of matching results for each type will be shown in parenthesis. 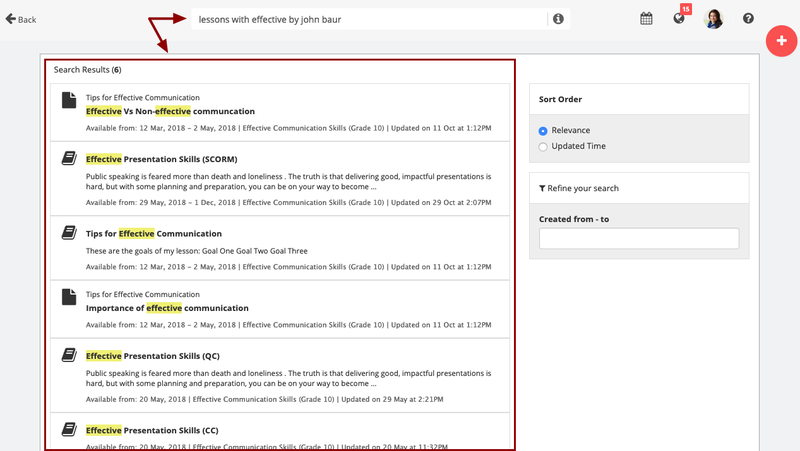 For example, Posts (16) signifies that the searched term/keyword is present in "16" posts on Teamie. 2. 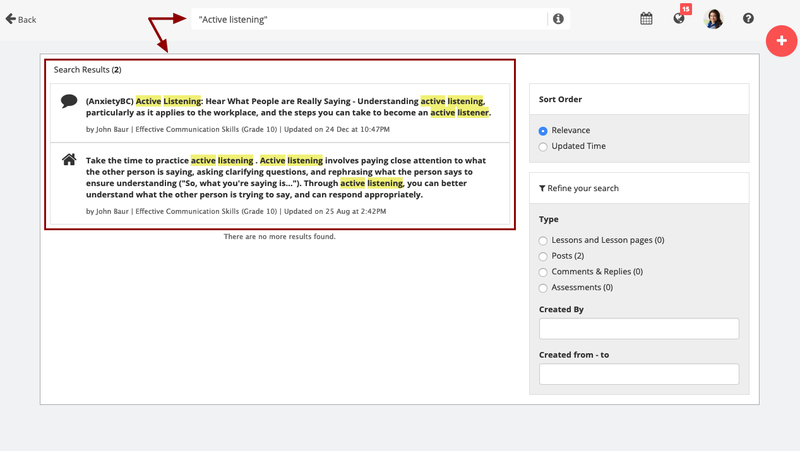 Click Lessons and Lesson pages radio button to view the matching results of the searched term/keyword in lesson(s) and lesson page(s). 3. 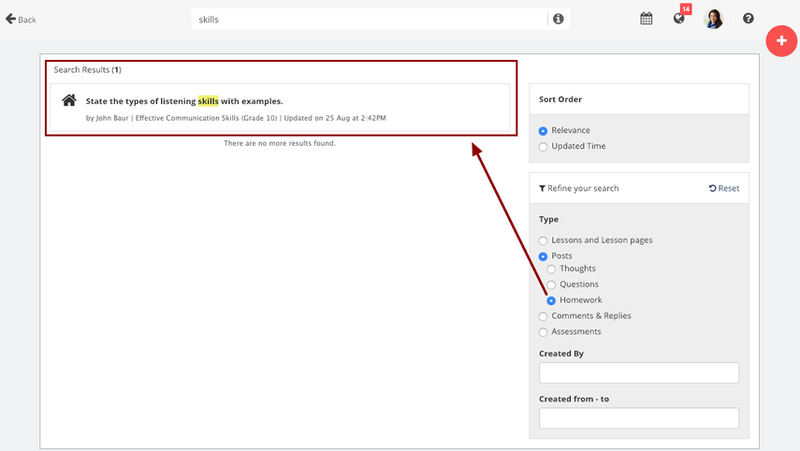 Click Posts radio button to view the matching results of the searched term/keyword in different type of posts. 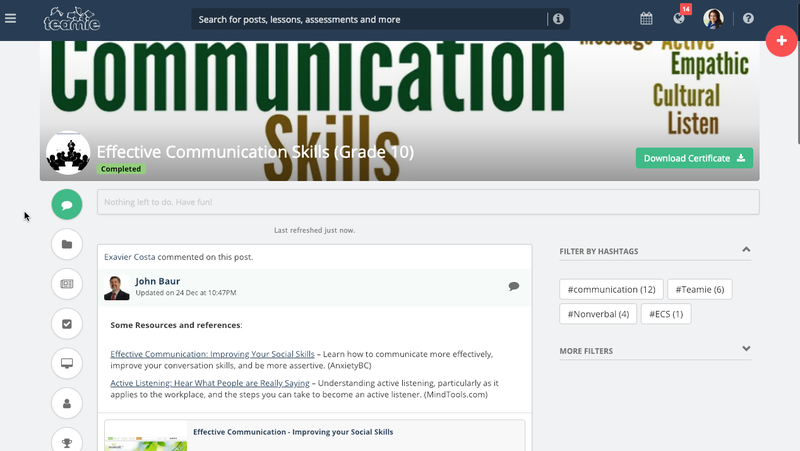 The posts filter will be further divided into the three types of posts - Thoughts, Questions and Homework. 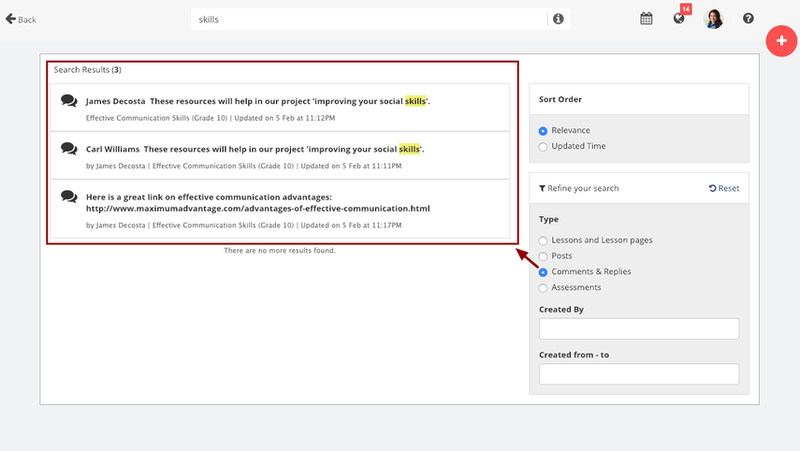 The number of matching results for each type of post will be shown in corresponding parenthesis. For example, Thoughts (9) signifies that the searched term/keyword is present in "9" thoughts. 4. Click Thoughts to filter out the thought post(s) in which the searched term/keyword was present. 5. 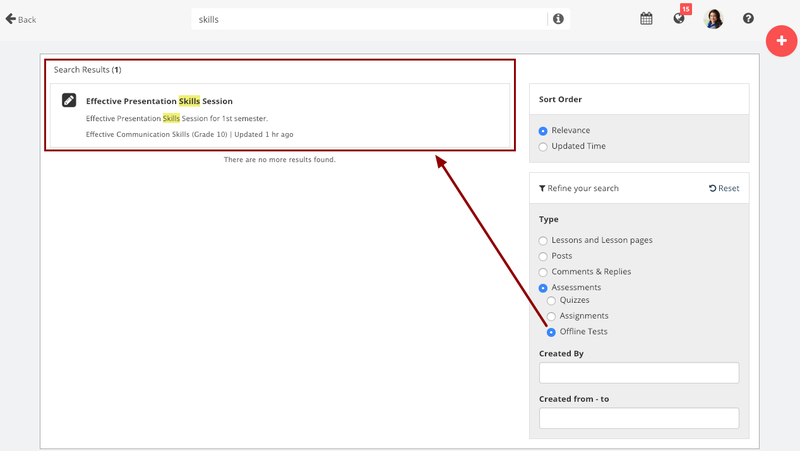 Click Questions to filter out the question post(s) in which the searched term/keyword was present. 6. Click Homework to filter out the homework post(s) in which the searched term/keyword was present. 7. Click Comments and Replies radio button to view the matching results of the searched term/keyword in comments and/or replies in posts. 8. 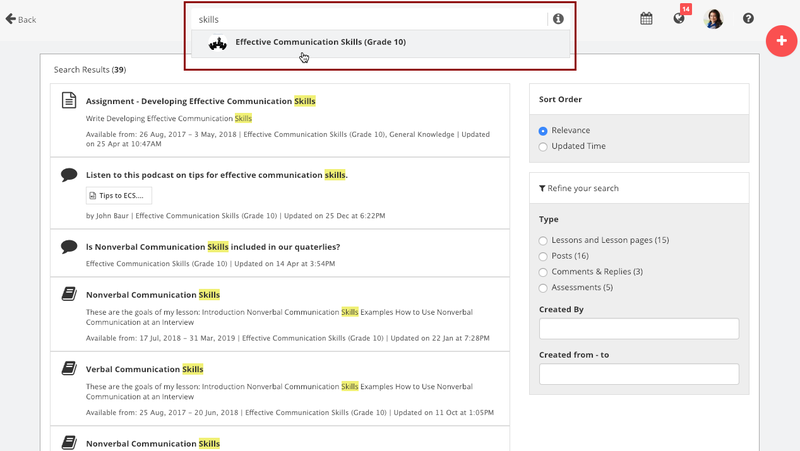 Click Assessments radio button to view the matching results of the searched term/keyword in different type of assessments. 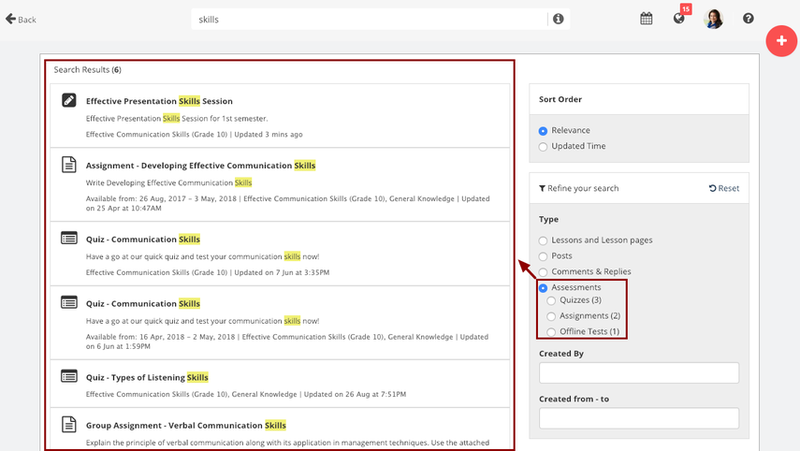 The assessments filter will be further divided into the three types of assessments on Teamie - Quizzes, Assignments and Offline Tests. 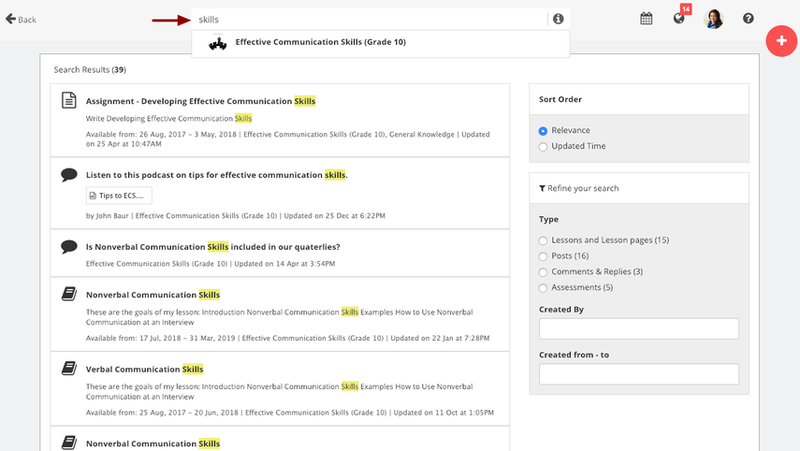 The number of matching results for each type of assessment will be shown in corresponding parenthesis. 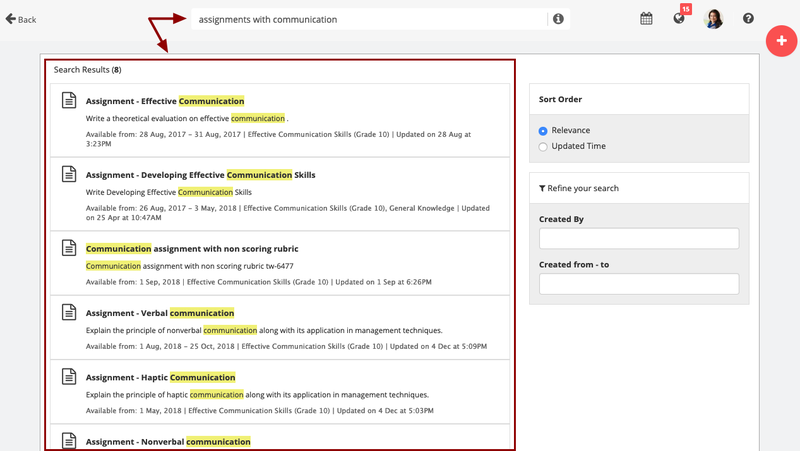 For example, Assignments (2) signifies that the searched term/keyword is present in "2" assignments on Teamie. 9. 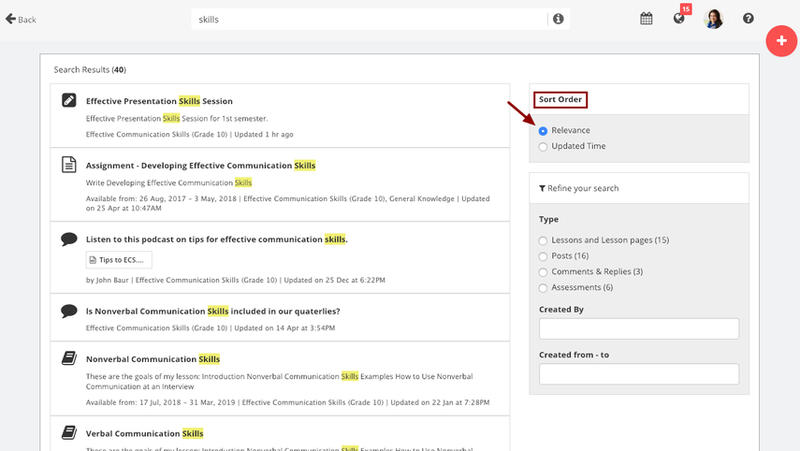 Click Quizzes to filter out the quizze(s) in which the searched term/keyword was present. 10. Click Assignments to filter out the assignment(s) in which the searched term/keyword was present. 11. Click Offline Tests to filter out the offline test(s) in which the searched term/keyword was present. 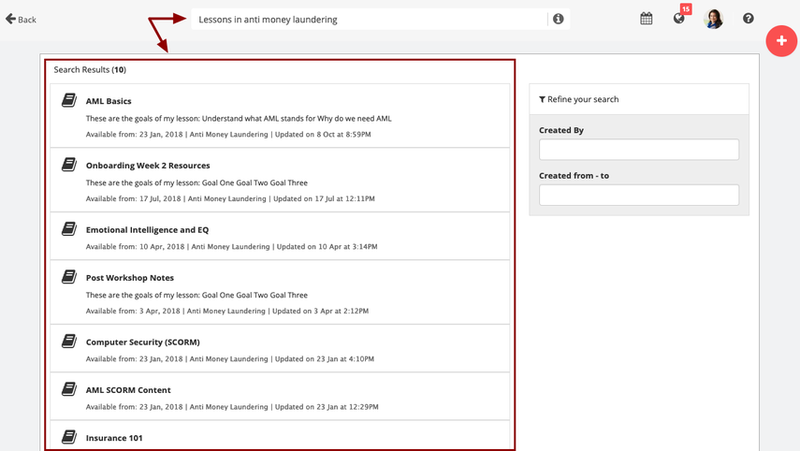 In case no matching results are found, you will be shown a screen similar to the following screenshot. 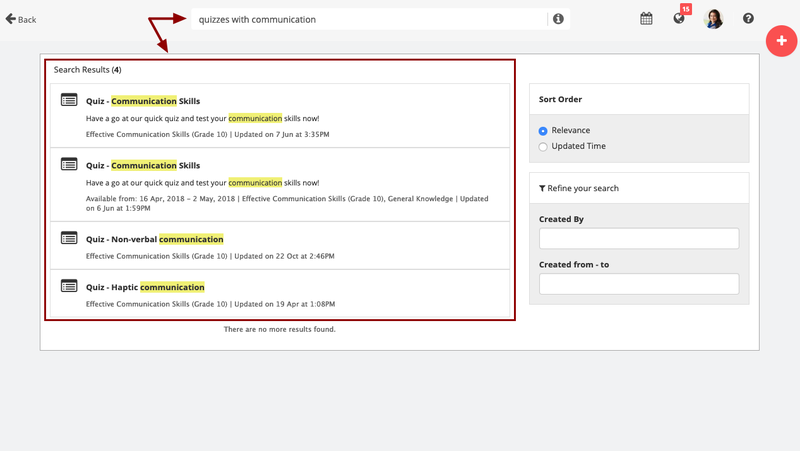 You can refine your search by using different search operators. 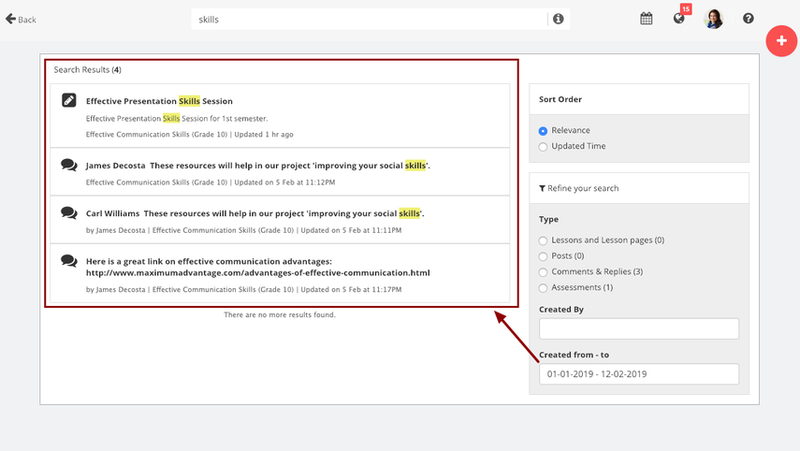 You also have the option to further refine your search by filtering posts on the basis of individuals who have created them. 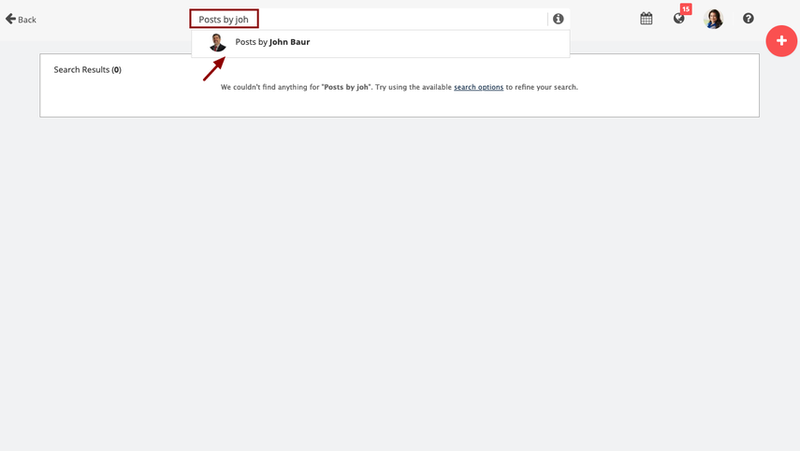 Just type in the name of the person whose posts you are interested in, and select the matching individual's name. 1. Enter the required keyword in the search box and search the content you are looking for, then click Created By. 2. 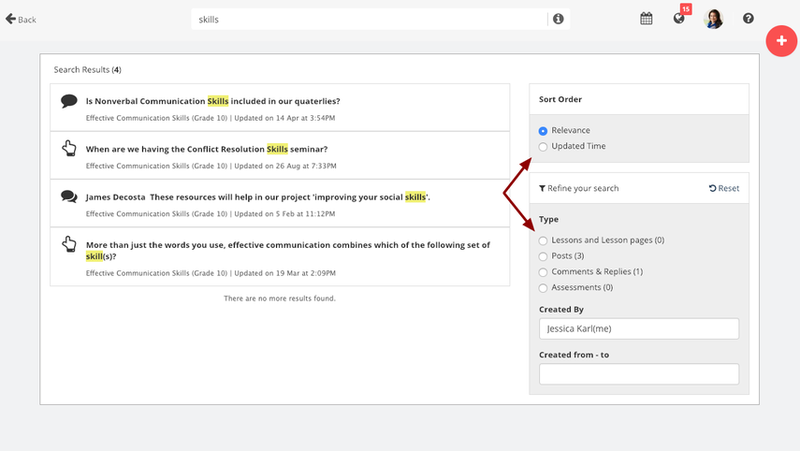 You will initially be shown the option to filter the content created by you. Click created by me to filter the content created by you from the search results. You can also use the 'Sort Order' and 'Type' filters to further narrow down your search. 3. 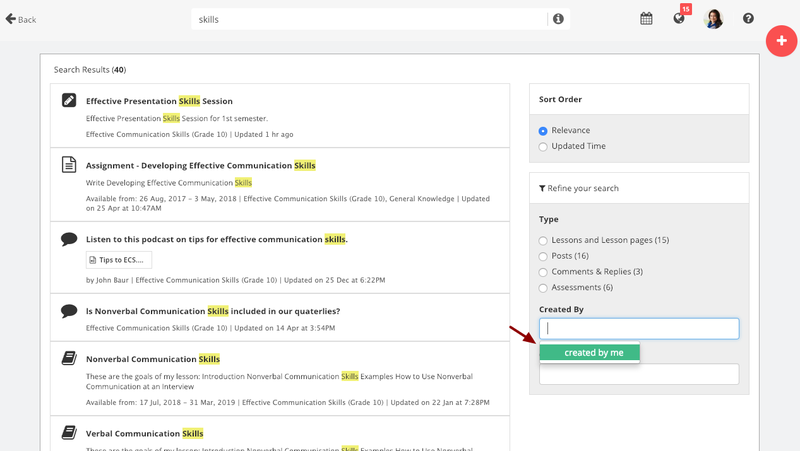 Similarly, you can filter search results for the content created by your connections by typing their name and selecting the required user from the auto populated list. 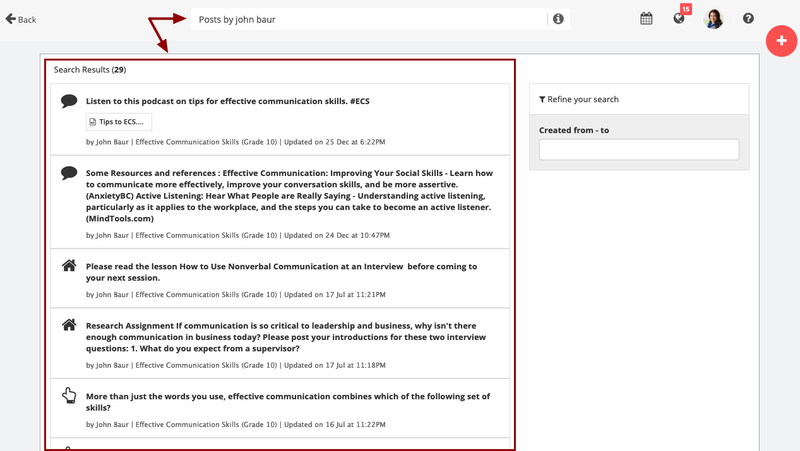 You can also narrow down the search results for a particular time period. 1. Click Create from - to. 2. 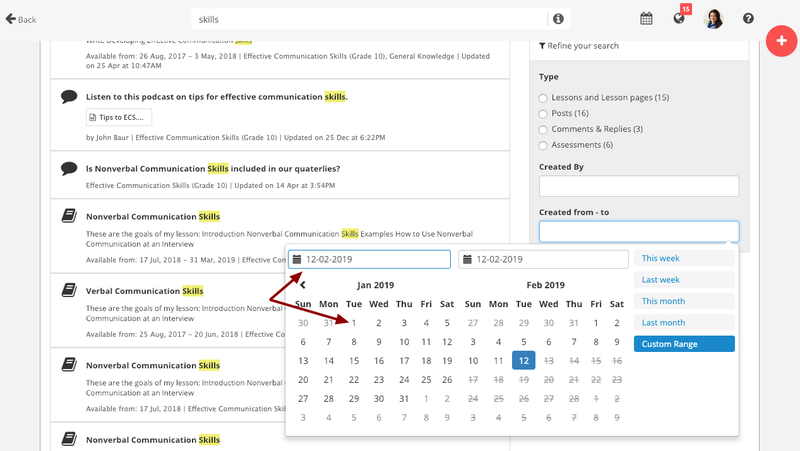 Select the from date. 3. Select the to date. 4. 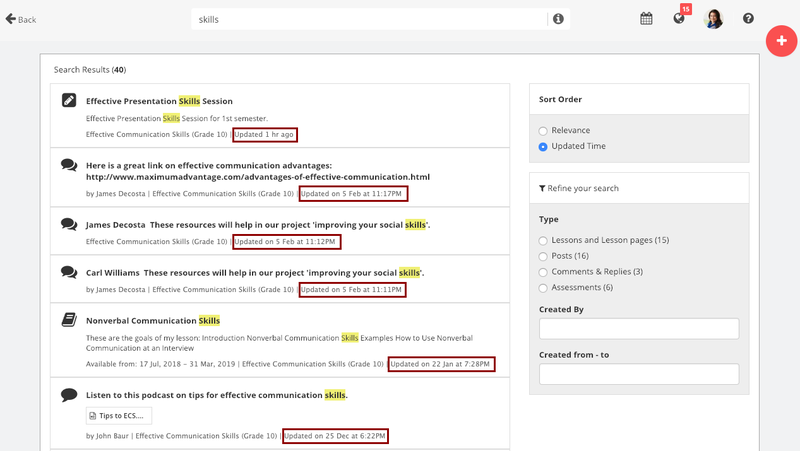 The system will show you the relevant content for the selected period of time (both dates included). 1. By default, the search results are sorted on the basis of relevance in the Sort Order section. 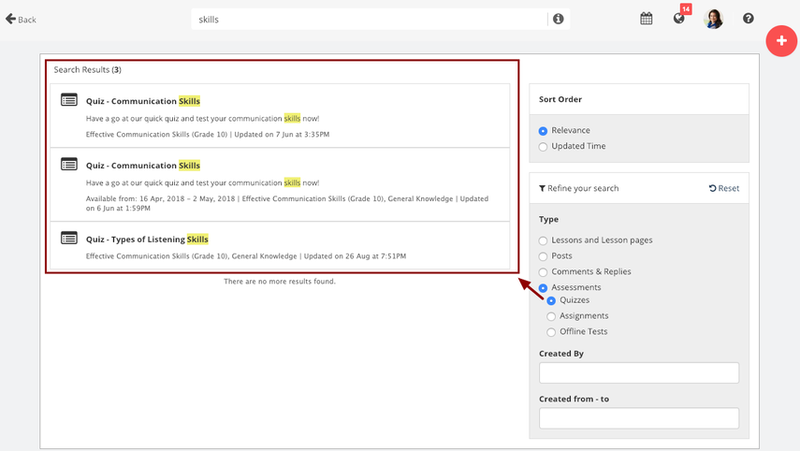 By relevance, we mean that the search results are populated keeping in account certain factors that are relevant to the search, such as, the number of times the searched term/ keyword appears in the populated results, whether it appears in the title/description of different materials etc. 2. You can also sort search results chronologically as per their updated time. 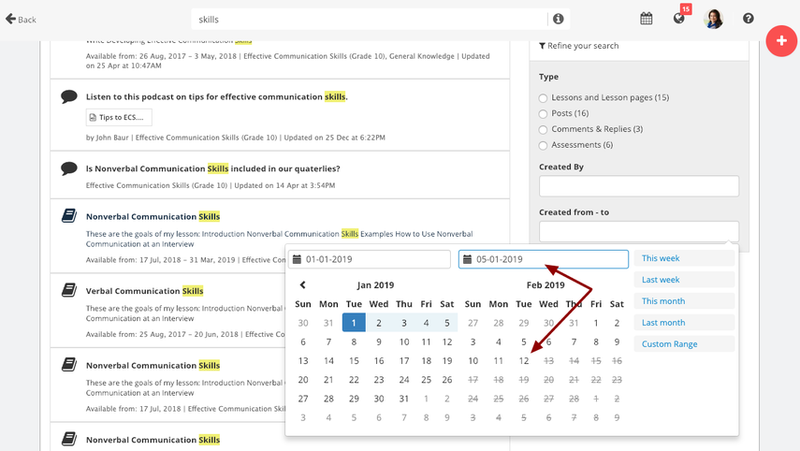 Click the the Updated Time sort option to view results based on their last updated time (most recent shown at the top). 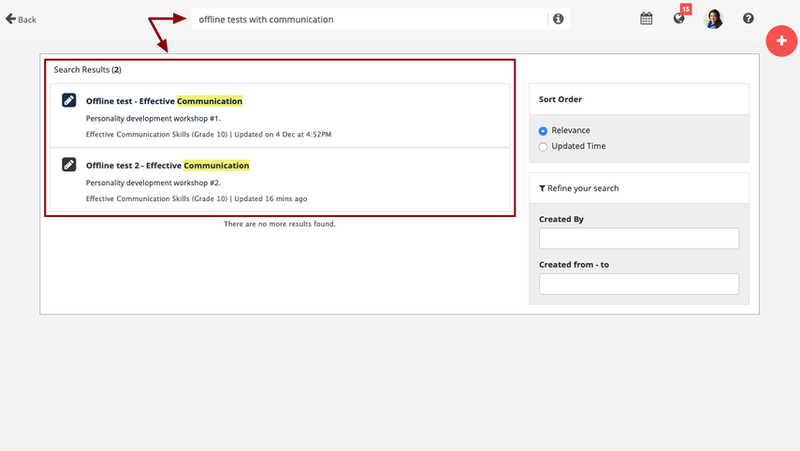 If the search is sorted for Relevance and some results are equally relevant, then they will be sorted by latest updated time. Furthermore, if the search has no term (ex. Posts by me), then the results are ordered reverse chronologically by default. 1. Click the 'i' icon placed besides the search box. 2. You would be able to see the options available for you to execute your search more efficiently. 1. 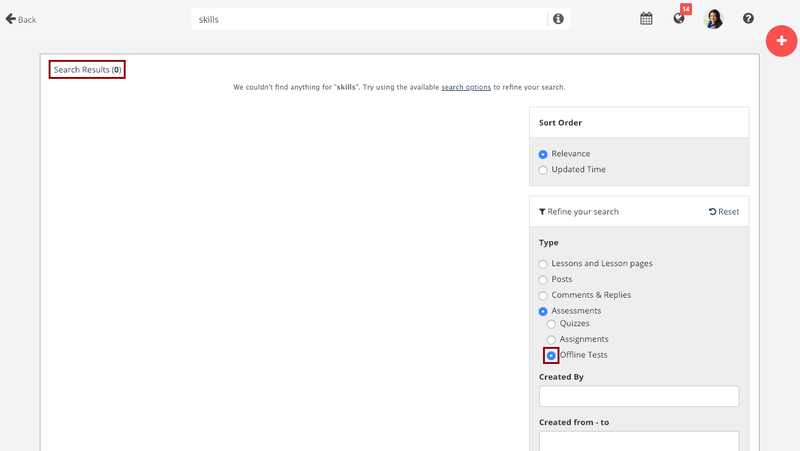 Enter '#' followed by a required term/keyword to find content which includes that hashtag. 2. 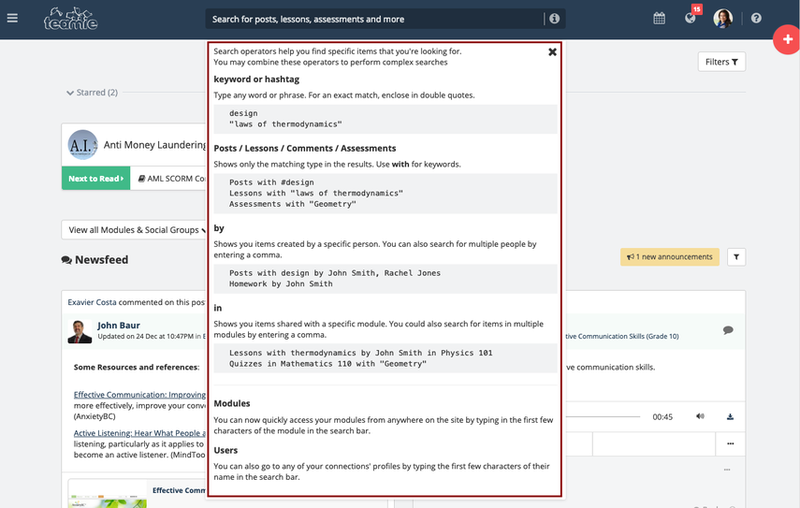 For an exact match, enclose your search term or keywords in double quotes. 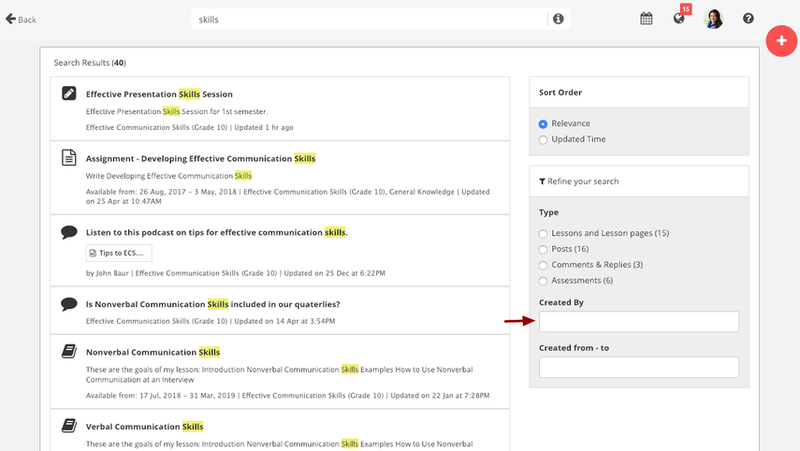 You can further refine your search by using the Created By and Created from - to filters. 2. 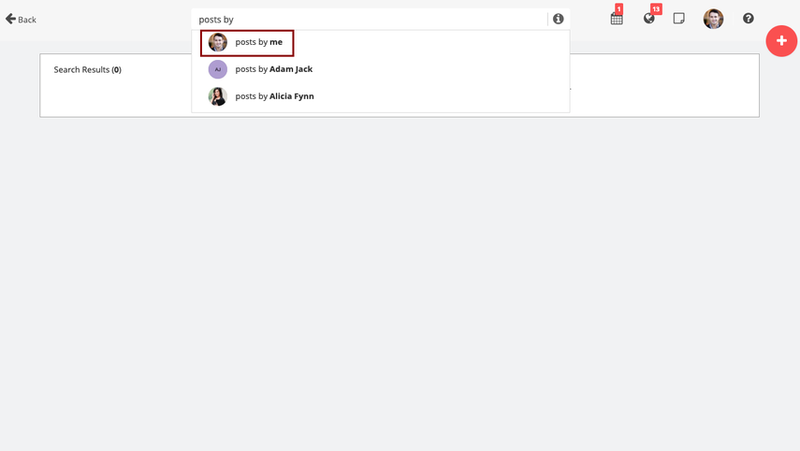 Teamie will suggest users' names when you start typing Posts by and thereby cutting down your search time. 3. 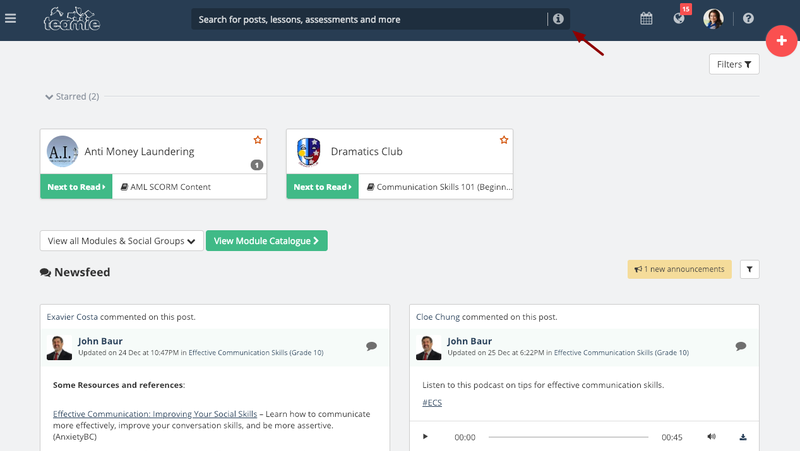 Once you type, "posts by", you will also see an option to search posts created by you in the form of a "posts by me" option. 4. You can also search for content created by multiple people by entering commas between their names. 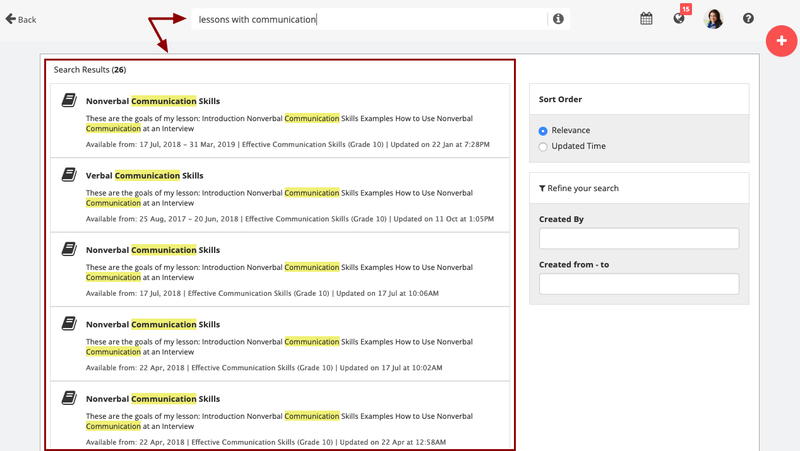 You may combine the aforementioned 'with' operator with 'by' search operator to perform complex searches. 1. 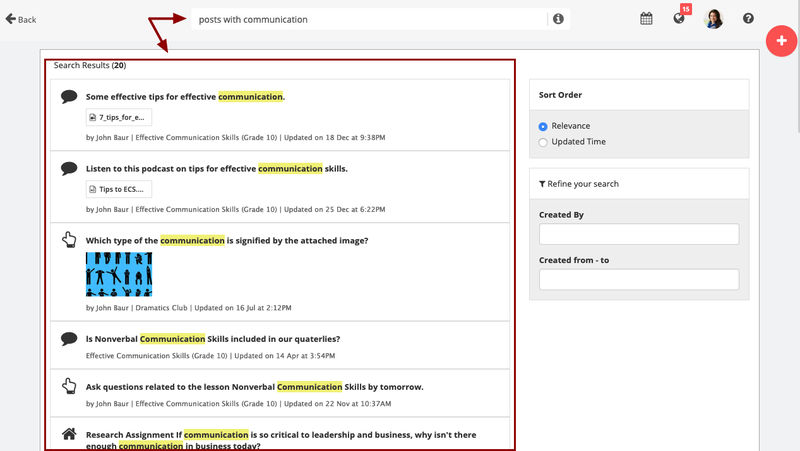 The search results using the search operator 'in' will yield all the items/content (posts and materials) in a certain classroom. Say you need to view all the lessons shared in a classroom named Anti Money Laundering. 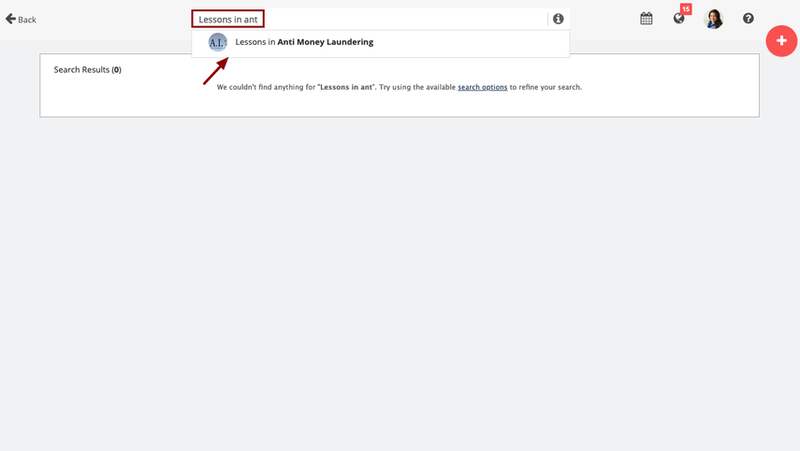 Just type in "Lessons in anti money laundering" and press enter. 2. Teamie will suggest classrooms' names when you start typing Lessons in and thereby cutting down your search time. 3. 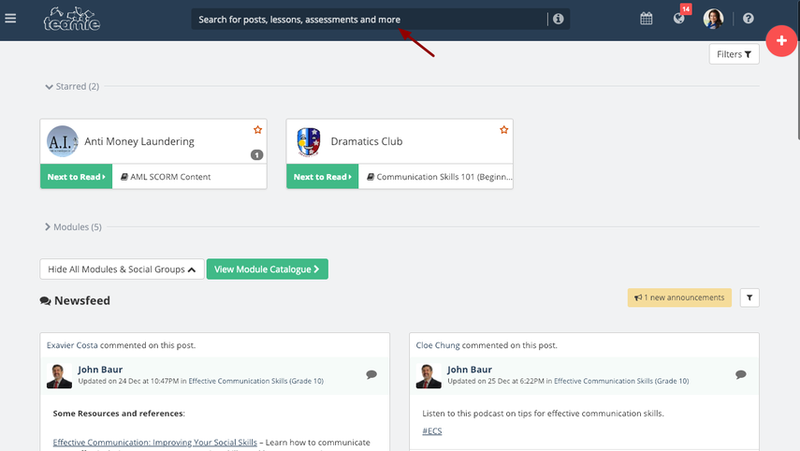 For searching posts in multiple classrooms, separate the classroom names with a comma. 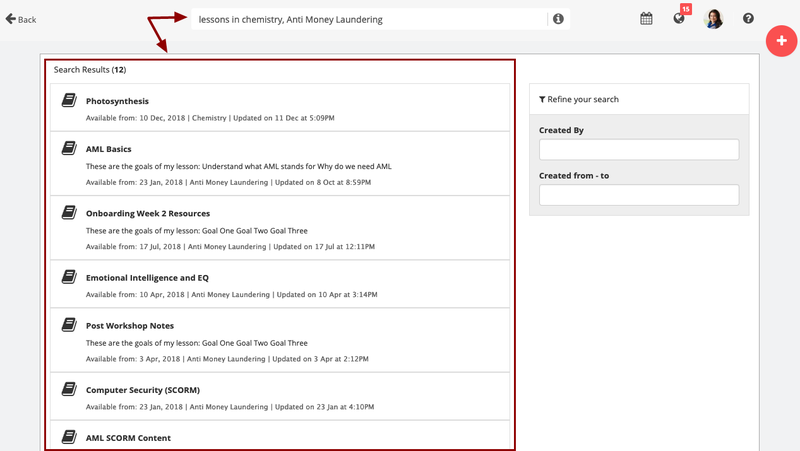 For example, "lessons in chemistry, anti money laundering". 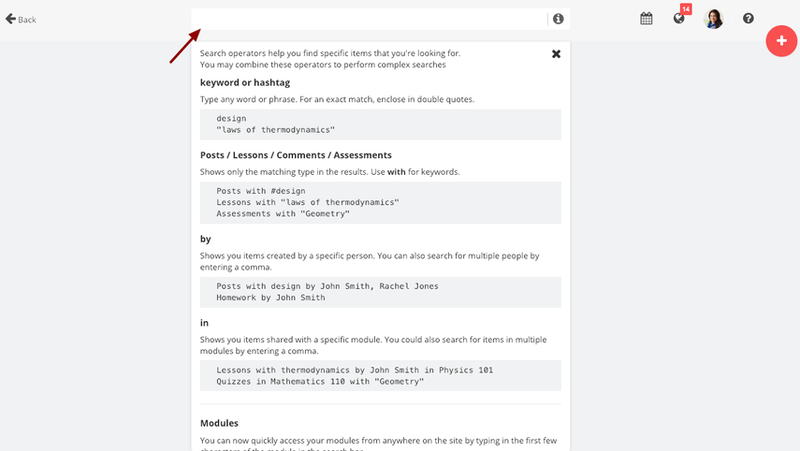 You may combine the aforementioned 'with' and 'by 'operator with 'in' search operator to perform complex searches. You can also perform complex searches by multiple users in multiple classrooms.